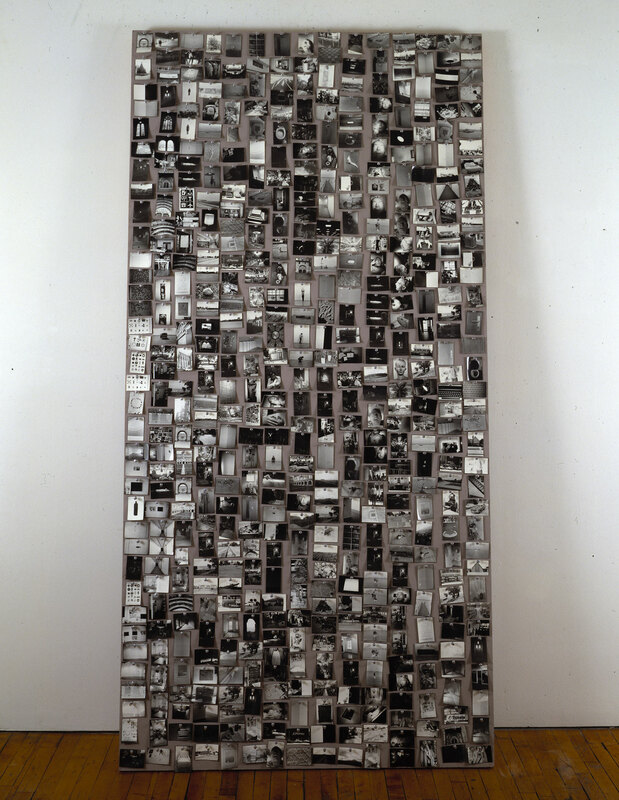 Matt Mullican, Untitled (Photo Bulletin Board), 1992; © Matt Mullican. Click image for larger view and better detail of the individual photographs. Faced with the totally administered, a sort of mysticism becomes a last resort, a line of flight from countless mundane tyrannies of the contemporary soul. In Matt Mullican’s Bulletin Boards series, the existence of everyday objects — a lamp, a sewer grate, a telephone, the banister of a staircase — is rendered both generic and numinous. Photographs of interior spaces (windows, doorframes, hallways) redouble the mental experience of looking. There is no whole, just a gathering of images whose haphazard constellation marks the continuous accretion of an archive. The Open remains open. The drafting or deliberate leaving-unfinished becomes a work regarding how worlds begin, how our “thrownness” (Heidegger) is accomplished. Liberated by distraction, we pay for this distraction with our lives. I don’t know if I am subject or object of this work, what the POV of a bulletin board is. The photograph of a Pinocchio puppet (spiritual automaton) hails me/the viewer. The corporate logo JCPenney signifies the arbitrary power of the name in a time of corporations, mass production, branding; the aura of its font, the curve of the letters — becoming artifactual. In a talk I saw Mullican give recently, he spoke of his persona under hypnosis (“That Person”), loving to draw the letters of the words Baby Love. Love of letters as letters, where an emotional identification with a world of things grasps us (human animals, consumers). The images of things before (or after) they have names become memento mori. Or reminders, as my wife likes to say, that we are “living corpses.” We form a fellowship with the dead. The artist’s fingers in the mouth of a corpse embody the burden of this fellowship. The photographs gathered and pinned here project a time in the future when we will seem even more strange to ourselves. Like a time capsule, hieroglyphs, artifacts — not just cosmology, but the future conditional tense of a speculative anthropology. The “self” or “I” or “That Person” or “Mullican” acting, at different points, as both the object and the subject of a cottage anthropological project. The arbitrariness of the symbol = the arbitrariness of fashion, of design, of the built world = the arbitrariness of facts, of photographic light and perspective = the arbitrariness of “us,” of relation. The practice of the artist induces Bardo, death in life, transmigration of the “soul at work.” I am reminded of Charles Olson’s phrase at the end of The Maximus Poems, “My wife my car my color myself.” Insistent punctuation of the possessive pronoun “my.” Though perhaps in Mullican’s work, the totally subjective (the artist’s investigation of dreams, and memories, and fantasies; his creation of a complex symbolic logic, as well as an architecture for symbolization) becomes objective where the “person” is exteriorized by compulsive output. The Bulletin Boards represent the rudimentary arrangements of this output, its substrate. Theyact as both archive and processor, open draft and mental map, invoking the subject who must become object-like in order to experience (their own) life. Thom Donovan is a writer, curator, editor, and archivist. He edits the weblog Wild Horses of Fire — now in its seventh year! — and co-edits ON Contemporary Practice, a print journal for critical writings and conversations. His book The Hole is forthcoming from Displaced Press.